267 Commonwealth is located on the north side of Commonwealth, between Fairfield and Gloucester, with 265 Commonwealth to the east and 269 Commonwealth to the west. 267 Commonwealth was designed by Snell and Gregerson, architects, and built in 1880-1881 by Webster & Dixon and D. G. Donovan, builders, as the home of Charles Boyden and his wife, Cora (Crowninshield) Boyden. 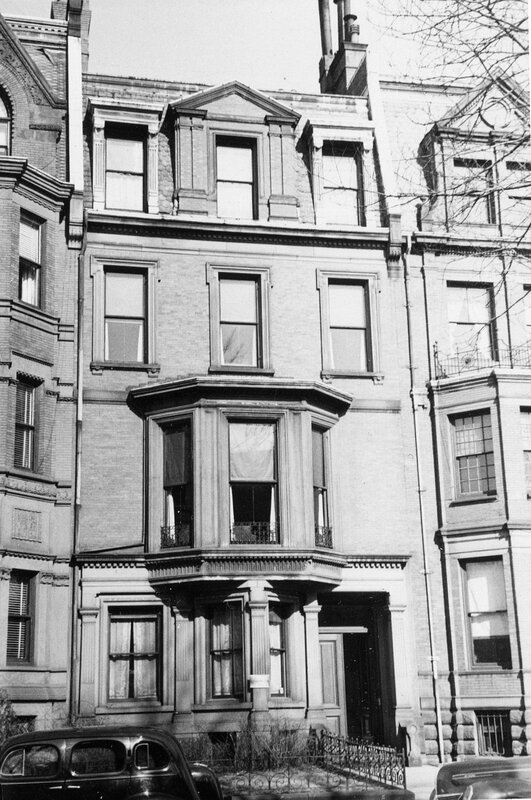 The Boydens had married in February of 1879 and lived at 279 Clarendon (which had been her home before their marriage) in 1880. Charles Boyden is shown as the owner of 267 Commonwealth on the original building permit application, dated December 7, 1880. Cora Boyden purchased the land for the house on November 15, 1880, from George Bruce Upton. It was part of a 106 foot wide lot George Upton had purchased on March 22, 1880, from Thomas Jefferson Coolidge, who had acquired it through several purchases. The land originally was part of one of several parcels purchased on January 29, 1866, from the Boston Water Power Company by a real estate investment trust formed by John Templeman Coolidge, Franklin Evans, and Charles Henry Parker. The trust had subsequently subdivided the parcels into lots, which it sold to investors and builders, who then frequently resold the lots to others. Click here for an index to the deeds for 267 Commonwealth. Charles Boyden died in May of 1881, before the house was completed, and Cora Boyden moved there as a widow later that year. She continued to live there during the 1903-1904 winter season, but moved thereafter to 224 Commonwealth. On March 9, 1904, 267 Commonwealth was purchased from Cora Boyden by William Hadwen Ames, He and his wife, Mary Elizabeth (Hodges) Ames, made it their home. They had lived at 173 Commonwealth during the 1902-1903 winter season. They also maintained a home in North Easton. William Ames was Secretary of his family’s business, the Ames Shovel Company, and later was president of the American Pneumatic Service Company, which built and operated pneumatic tube systems to deliver mail in Boston, New York, Chicago, and St. Louis. Mary Ames died in October of 1914. William Ames remarried in October of 1916 to Fanny Elizabeth Holt, formerly a stenographer with the American Pneumatic Service Company. He died in March of 1918. Fanny Ames continued to live at 267 Commonwealth. On November 13, 1924, 267 Commonwealth was acquired from Fanny Ames by investment banker Frederick Richard Sears, III. He and his wife, Norma (Fontaine) Sears, had married in August of 1924. Prior to their marriage, he had lived at 122 Beacon with his widowed father, Frederick Richard Sears, Jr.
Frederick and Norma Sears spent the 1924-1925 winter season in Florida and Fanny Ames continued to live at 267 Commonwealth (the funeral of her mother, Ida (Sinclair) Holt, was held at 267 Commonwealth in February of 1925). She moved soon thereafter. By the 1925-1926 winter season, Frederick and Norma Sears had made 267 Commonwealth their home. Frederick Sears, III, was the first cousin, once removed, of Cora (Crowninshield) Boyden: his grandfather, Frederick Richard Sears, was the brother of her mother, Harriet E. Dickason (Sears) Crowninshield. Frederick and Norma Sears continued to live at 267 Commonwealth until about 1937. The house was shown as vacant in the 1938-1941 City Directories. On May 2, 1941, 267 Commonwealth was acquired by the Malkin Conservatory of Music. It previously had been located at 299 Beacon. The Conservatory continued to be located there in 1942. On March 6, 1943, 267 Commonwealth was acquired from the Malkin Conservatory by Kathleen (O’Callaghan) Boning, the widow of Alfred Jacques Boning (Bonang). Their unmarried daughter, Margaret Boning, lived with her. They previously had lived in Milton. In May of 1943, she applied for (and subsequently received) permission to convert the property from a single-family dwelling into a single-family dwelling and lodging house. On November 22, 1948, she transferred the property into her and her daughter Margaret’s names. They continued to live there until about 1950. On August 29, 1950, 267 Commonwealth was acquired from Kathleen and Margaret Boning by Hilda Weber, the widow of Albert Weber, who operated it as a lodging house. She continued to live there until about 1958. On December 23, 1958, 267 Commonwealth was acquired by Margaret (Love) Newcomb, the wife of Marshall Rand Newcomb. He was an engineer with MIT and she was a social worker. They previously had lived in an apartment at 195 Marlborough. They continued to live at 267 Commonwealth in 1959, but had moved to 3 Fairfield by 1960. On August 31, 1959, 267 Commonwealth was acquired by Pietro Belluschi. He and his wife, Helen (Hemmila) Belluschi, lived at 1 Fairfield. Pietro Belluschi was an architect and, from 1951 to 1965, was Dean of MIT’s School of Architecture and Planning. In 1956, he designed the First Lutheran Church at 299 Berkeley. On September 21, 1961, 267 Commonwealth was acquired from Pietro Belluschi by Justin W. Griess and his wife, Katherine (Haskell) Sears Griess. They lived at 421 Beacon. Justin Griess was founder and owner of Yankee Maid Products, a household design and outfitting firm on Newbury Street. 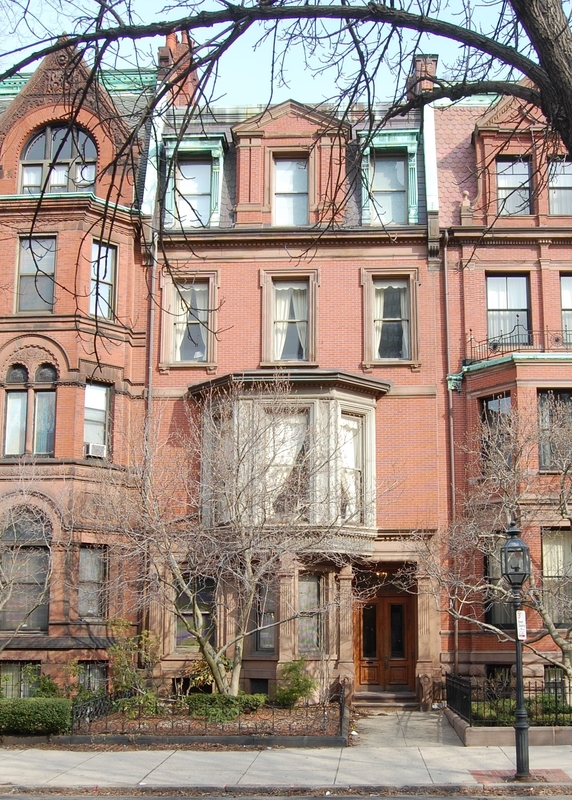 After he retired, he purchased and remodeled houses in the Back Bay and Beacon Hill. He also was a prominent breeder of poodles. In March of 1962, he applied for permission to convert the property from a lodging house into six apartments. The permit was approved but it is unclear that the work was ever done. On July 16, 1962, 267 Commonwealth was purchased from Justin and Katherine Griess by brothers, Charles George Alex and Daniel (Demosthenes) G. Alex, and their mother, Helen G. (Kokinakis) Alex, the widow of George Konstantinos Alex (Alexopoulos). Earlier in July of 1962 they had purchased 255 Commonwealth, and in August of 1962, they purchased 269 Commonwealth. 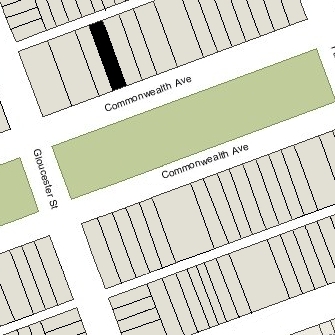 By 1963, all three properties had been leased as dormitories by Chamberlayne School and Chamberlayne Junior College, located at 128 Commonwealth. 255 Commonwealth was operated as Gloucester House and 267-269 Commonwealth were operated as Windsor House. They continued to be located there until the late 1970s, and possibly later. By 1965, 267-269 Commonwealth also were the offices of Datalex Inc., a scientific instruments firm. Charles Alex was president and treasurer of the firm, and Daniel Alex was the corporation clerk. It continued to be located there until the early 1970s. On April 21, 1967, Helen Alex transferred her interest in 255 Commonwealth, 267 Commonwealth, and 269 Commonwealth to Charles and Daniel Alex. In November of 1978, Charles and Daniel Alex sold 255 Commonwealth. On June 2, 1980, Daniel Alex transferred his interest in 267 Commonwealth and 269 Commonwealth to his brother, Charles. In May of 1980, Charles Alex applied for (and subsequently received) permission to convert 267 Commonwealth from a lodging house into ten apartments. On June 1, 1983. Barrett Enterprises, Inc., purchased 267 Commonwealth from Charles Alex. He continued to own 269 Commonwealth. Barrett Enterprises was owned by Diana Barrett, a real estate consultant and developer, and her husband, Robert J. (Bob) Vila, a contractor and restoration specialist who, from 1979 until 1989, was host of the Public Television series “This Old House” about the renovation of vintage homes. Barrett Enterprises remodeled 267 Commonwealth and rented apartments on a weekly and monthly basis to short-term residents. On December 13, 1995, 267 Commonwealth was acquired from Barrett Enterprises by the Hamm Holdings Corp. of Wilmington, Deleware. The property subsequently changed hands. It remained an apartment house in 2017.